Prior to any installation, any previous versions of FleetWork, SygicMunicipal or Sygic 2D Fleet Navigation (Drive) should be un-installed and all the related resource directories removed from the Android device. Sygic Municipal is not present on Google Play. Sygic provides directly (via an ftp link) an apk file and a zip file including the application resources and optionally a zip with map files (if they are not included in resources). Please download the apk file. Install the application by clicking on SygicMunicipal.apk. When installation starts, you should accept all the permissions requested by the application. Copy the resources to SygicMunicipal folder created during the apk installation. 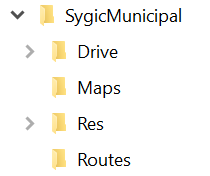 SygicMunicipal has 4 sub-directories: Drive, Maps, Res and Routes. If you did not receive map files separately, please skip this step. If you received the maps separately, please download and unzip the maps. Done. You can run the application.